Hi everyone, belated Happy New Year wishes! the festive season & I'm only just getting back to normal now! Praise the lord for antibiotics! before I took to my bed! If you're on the Crafting Cafe FB group blog hop, welcome! I'll try to get round all the blogs as soon as I can! A little 6x6 inch Monochrome Engagement card! for texture, then added some lace & ribbon from my stash. I added a little punched heart detail in one corner & a little bling to balance it up. I love this card..... always love popping over to your blog - always very inspirational! This is a fabulous card Dawn, such an elegant design. I'm sorry to hear that you have been so poorly, I hope you have fully recovered now. Lovely card and love the different embossing textures. i think we have all had this lurgy, it likes to out stay its welcome. Glad your back on your feet. 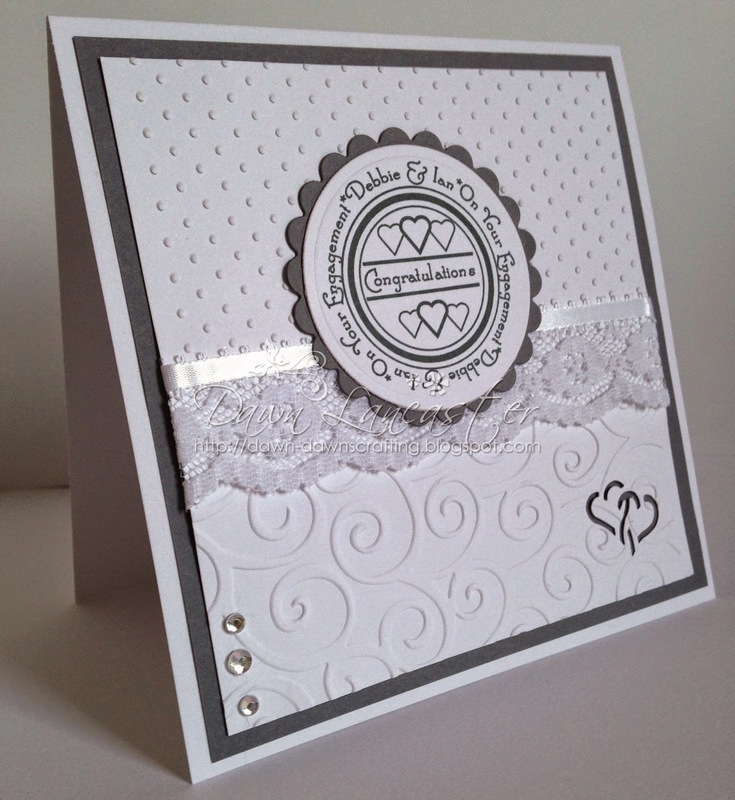 Beautiful card, love the embossing and lace, love the clean look with black and white. Oh no Dawn, so sorry to hear you've been sick! I thought maybe you were off on holiday! Glad you are feeling better! Your card is beautiful and very elegant! Happy New Year Dawn, so very sorry to hear you have had the lurgy. I hope you are a lot better now. A gorgeous monochrome card. You.ve been missed, My friend. So glad you're feeling better and are back sharing this spectactular card with us. :-D Love the embossing and that lace is magnificent! This is a very elegant card. Beautiful combination of embossed patterns and I like the personal touch of adding the names as part of the sentiment. I love your black and white theme and all the patterns that you used. It came out great and it's nice to hear you are healthy again after the holidays. Thanks for sharing your card with us on the RRR Challenge this month. very pretty engagement card. I really like the use of the white lace. Thank you for playing along with DRS Designs this week! Congratulations! Really lovely card, simple and elegant. Thank you for joining challenge you to Stampartpapel. Beautiful card. Thank you for joining us at Retarte at Stampartpapel. We hope to see you soon. Gorgeous mix of textures, and love the black and white. Very effective. On a slow, late, hop! I LOVE your project! Thanks so much for playing along at Really Reasonable Ribbon. See you again soon!! !